The magnificent islands of Antigua and Barbuda lie between the Caribbean Sea and the Atlantic Ocean. Blessed with a wonderful climate, the islands usually play the part of a romantic getaway for newlywed couples eager to avoid the fuss on some of the more popular Caribbean destinations. Luckily for the lovebirds, the islands of Antigua and Barbuda are named “The Land of 365 Beaches”, and this title suits them perfectly, since most of the shores of the archipelago are covered with beautiful sandy beaches. Besides the two nominal islands, there is a large number of smaller islets in the country, including seven prominent ones. They are called Great Bird, Green, Guiana, Long, Maiden, York Islands, and the island of Redonda on the mere South. St. John’s, the state capital and the largest economic center, is located on Antigua island. The country is considered a member of the Commonwealth, an intergovernmental alliance of countries formerly known as the external territories of the British Empire. Because of this, the official language in the country is English, while many citizens still commonly use their Caribbean creole language. 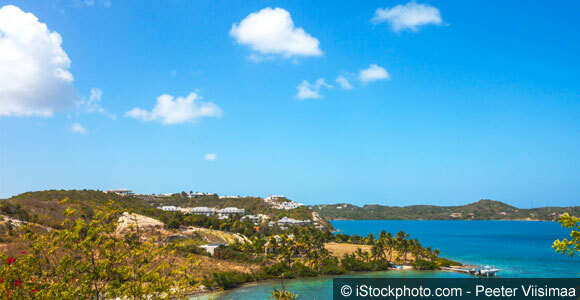 Area: 171 square miles (Antigua 108 square miles; Barbuda 6.2 square miles). About 2.5 times the size of Washington, DC. Government: Constitutional monarchy with a parliamentary system of government and a Commonwealth Realm. Head of State: Queen Elizabeth II (since 6 February 1952); represented by Governor General Rodney Williams (since 14 August 2014). Head of Government: Prime Minister Gaston Browne (since 13 June 2014). Language: English (official), local dialects. Religion: Protestant 68.3% (Anglican 17.6%, Seventh Day Adventist 12.4%, Pentecostal 12.2%, Moravian 8.3%, Methodist 5.6%, Wesleyan Holiness 4.5%, Church of God 4.1%, Baptist 3.6%), Roman Catholic 8.2%, other 12.2%, unspecified 5.5%, none 5.9%. As is the case with many others countries of the British Commonwealth, the country of Antigua and Barbuda is located south-east of Puerto Rico, with Montserrat and Guadeloupe being the closest neighboring countries. The most developed island in the archipelago is the titular Antigua, filled with luxury resorts and thriving tourism infrastructure. The island’s airport is located near the town of St. John and is easily reachable by plane, since there are direct flights available from the largest airports in the United States, Canada, Europe, and other Caribbean islands. When you reach Antigua, you can fly by charter further to Barbuda, or visit other smaller islands by ferry or boat. 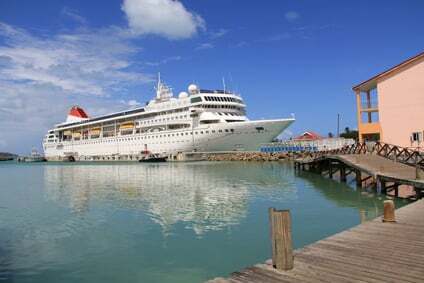 Antigua is also a popular spot for large cruisers, and many cruising companies offering daily excursions. There is a small list of countries whose citizens should apply for a visa before visiting Antigua and Barbuda. As stated in some of the world’s most renowned tourist magazines, Antigua is considered the “Caribbean’s Most Romantic Destination”, which is the title they are trying to keep. Barbuda, on the other hand, also has wonderful beaches, but lacks the highly-developed infrastructure. This is why this destination is suitable both for adventurers and laidback types. 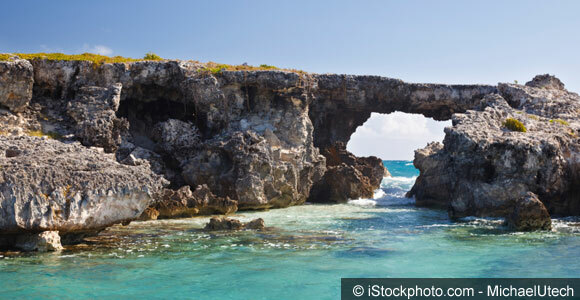 The islands are dotted with breathtaking natural parks, included in everybody’s must-see lists, while the sites like Nelson’s Dockyard National Park, Shirley Heights, and Fort Barrington provide much-needed insights into the country’s history. Island safaris, boat tours, scuba dives, and snorkeling are the usual to-go activities. In recent years, the ever-exciting helicopter tours have gained popularity, since they provide a fresh look at island life. On the other hand, you can always just take a hike, rest on one of the islands’ many beautiful beaches, or go on a mini road trip along Fig Tree Hill, the fruitiest route in the Caribbean. There is a surprising number of quirky activities citizens of Antigua and Barbuda enjoy frequently. Locals usually play their own tropical version of “count and capture” called Warri, which is basically an ancient board game played with shells and cups. The national sport is cricket and locals are pretty proud of the fact that the Cricket World Cup was held here in 2007. Famous cricket player Sir Vivien Richards is considered a national legend and the sports arena in the capital is named after him. With such pedigree, it is no wonder that the islands lean closer to the luxury side of the price spectrum. Although it is possible to find a decent bed and breakfast for $40, high-end resorts are pretty expensive when compared to similar destinations. On the other hand, a long-term stay in Antigua and Barbuda could be considered a wise move, since the actual cost of living is not as high. Still, keep in mind that the country is still in development, so the lack of usual intercontinental activities is probably the main reason why the expenses are so limited. The cost of living in this country is, on average, 20% lower than in most countries in Northern America and Europe. For instance, a monthly rent for a multi-room apartment is around $2,500 in the expensive area, around $2,100 in the usual areas, while the rent for smaller apartments is almost twice as cheap. A gallon of gas is $2.75, while a cup of coffee costs about $10. Basic lunch menus cost in between $20 and $30, while a dinner for two in a fine restaurant could cost up to $300. 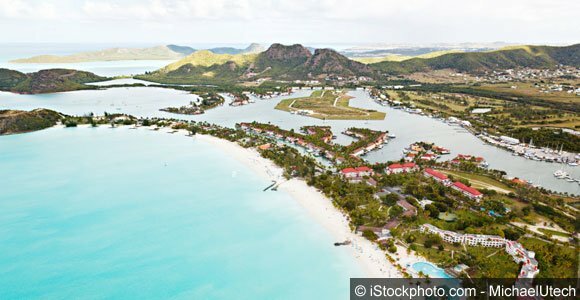 The islands of Antigua and Barbuda certainly live up to their advertisements, if you can afford it. Although primarily a visiting destination and not the most popular residence choice, it can provide a peaceful and idyllic setting for those looking for a break from the noise of 21st century modernity.